Hot on the “heels” of my “Fight Like a Girl” post from earlier this month, here is another very cool event I couldn’t wait to share with readers. Many thanks to Ashton for passing it along! Via a Raleigh Fire Department email:On Sunday October 4, 2009, The Pink Heals Tour, formerly The Pink Ribbon Tour, will be appearing in Raleigh during their country wide journey. The Pink Heals Tour is a nonprofit organization founded in Phoenix, Arizona by firefighter Dave Graybill that drives Pink Fire Trucks across the United States to support women in their fight against cancer and inspire men to get involved. This year’s tour includes three pink fire trucks and the sculpted Ribbon of Hope. It is a unique opportunity to dress in the Tours pink turnout gear and helmets and sign the fire trucks in memory or honor of loved ones. The Raleigh Fire Department is hosting this year’s event with The Pink Heals Tour to raise cancer awareness at Triangle Towne Center between Dillard’s and Macaroni Grille from the hours of 12:00 noon to 4:00 pm. We extend an invite to your department to be a part of this community event. Please spread the word to your family and friends and come join the fun for this very important cause. 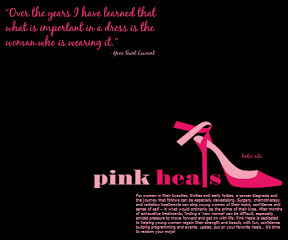 For more information about the Pink Heals Tour visit www.pinkheals.org. We look forward to seeing you there.The group’s goal?Pink Heals: Confidence building activities in a supportive social setting to help young Survivors during the post-treatment transition.Amazing, humbling, and inspiring – all at the same time! Please feel free to re-post – hope to see some of you there! If you’re not local, I hope there’s an opportunity for you to experience this in your own area. You can Become a Fan on facebook, follow on twitter, and shop for really cute merchandise to support the group!